Copyright © 2002 Balmoral Software (http://www.balmoralsoftware.com). Portions copyright © 2002 Cryo S.A. and DreamCatcher Interactive, Inc. All rights reserved. Republication or redistribution is expressly prohibited without the prior written consent of Balmoral Software. The Mystery of the Nautilus is a recent release from DreamCatcher that involves exploration of the famous submarine in a standard inventory-manipulation graphic adventure. The authors, T-bot Interactive, have taken some liberties with the traditional, Disneyesque layout of the ship, but most of it is reasonably believable. Played in the first person, the game has you being a marine scientist who has discovered the long-lost ship. You are the only one onboard the Nautilus, and most of your goals center around overcoming obstacles put in your way by the ship's defensive computer, which has been programmed by the departed Captain Nemo. The gameplay is fairly long, and is separated into five separate stages. Your inventory is reset at the beginning of each stage, so the individual parts may feel somewhat like separate games. Very few standalone puzzles are found in the game, with the vast majority of time being spent in pixel-searching and inventory manipulation. The graphics of the game are enjoyable, but not particularly sharp. No new ground is being broken here. In the occasional encounters with Captain Nemo's hologram, he is a coarsely-rendered cyberpuppet with bad lip sync and strange repetitive motion. However, this does not detract from gameplay and does offer a little context for the myriad inventory puzzles you're trying to solve. We found the video transitions during the node-based movement to be rather ugly, but again this was not a major drawback. Generally, the graphics seem to present a lot of atmosphere in the game. Adding a few incidental animations would have made them more immersive. The basic game interface is fairly intuitive, using an onscreen "PDA" for game control, text replay and certain game-specific functions. The game provides only 24 saved-game slots, although these can be reused if files are moved externally, and overwrite warnings are provided. Each slot is identified by a timestamp, ship location and thumbnail, so the lack of file-based naming was no drawback at all. Onscreen functions are handled by a smart cursor that indicates possible action, movement or application of an inventory item. Inventory is accessed through a vertical scrolling bar that can be displayed or hidden with a mouse click. However, the backpack icon for the inventory is always on the screen and often gets in the way when navigating. A better inventory system would have involved placing a wielded item into the inventory by simply right-clicking the mouse, rather than forcing the cursor to be moved to the onscreen icon and often shifting the viewport. On the plus side, we never had to contend with combining items together in the inventory, and most items thankfully disappear after use. The game plays from a single CD. The booklet that comes with the game is thorough and professionally done. Game navigation uses the standard Cryo/DreamCatcher 3D spherical node-based VR in which full 360-degree panning as well as up-and-down motion are available at discrete navigation nodes. Some of the bird's-eye-view maps available in the PDA helped to identify our position in the game, but no map-based navigation is possible. In fact, many of the challenges in the game involve gaining access to areas that are initially unreachable. The game's plot is fairly direct, but on occasion you may find your immediate goals a little unclear since they may require an assumed knowledge of the ship's operation. Several areas or "sets" in the game are reused in an interesting manner as changes to the environment take place. Some background information can be obtained during the various playbacks of the ship's computer. The gameplay is fairly single-threaded, and a few of the "trigger" events in the plot are very obscure. But with perseverance (and perhaps this walkthrough), you will prevail! Generally, the game played fair with the logic of its puzzles and challenges, and most were fun to solve. A few involve timed sequences, but these were not a major stumbling block. Music in the game seems satisfactory, with nothing coming across as jarring or inappropriate. Sound effects are provided liberally, and voice acting is quite clear. It would have been nice to have the player's own comments read out loud, as is done with the comments of the other characters. A few minor technical glitches were experienced in areas where the smart cursor got "stuck" in one (misleading) state and no longer reacted as needed. A few ghostly "grab-it" cursors remained after an item had already been taken from the environment. The Mystery of the Nautilus offers a standard graphic adventure gameplay in an interesting environment. Decompression Chamber. A new game starts out in the decompression chamber onboard the Nautilus. You have activated a computer-controlled ship defense system. Many of the challenges you'll face will involve circumventing these defenses to discover the mysteries of the ship. Right-click to advance the dialog box - initially, the ship's computer thinks you are Captain Nemo. Approach the door, turn left slightly and unlock the door by clicking on the handle connected to the vertical chain. A cutscene of a gauge will show the pressure equalizing in the airlock. Click three times on the porthole of the door, then click on the door to rotate its handle and move forward. Diving Gear Chamber. Turn right and click on the piece of paper on the floor next to the puddle of water. A note describes the ship's protection system. Click on the lower right corner of the note to return to the game. Move up slightly and open the top drawer in the chest. Pick up the gloves inside and click them on the backpack icon to store them in your inventory. Wear the gloves by opening the inventory scrollbar, selecting them and then clicking on the human face. Pick up a screwdriver from the shelf immediately above the open drawer. Rotate 180 degrees and pick up a small silver ball on the lower left shelf. Turn to the right and approach the door at the far end of the chamber. Turn right and pick up what appears to be a basket on the lower left shelf. An electrical force field is protecting the exit from this room, and needs to be deactivated. Facing the exit door, turn left slightly and zoom in on the sparking control box. Insert the zinc ball from your inventory into the control box (be sure you are wearing the leather gloves before attempting this). Return to your position facing the door and click on its handle to open it. Move forward into a corridor. Library. Turn right and move down the corridor to the library door (see map). Open the door and enter the library. After a cutscene of a hologram of Captain Nemo (love those moves! ), go to the far end of the room where a ventilation fan is rotating. Turn left and zoom in on a shelf built into the wall. Open the large book lying there to see a hint on ventilation; note also that this book has a hole cut into it for storing something. Turn left and pick up a box of matches from inside the light fixture. Exit the library and move back to the center of the corridor. Dining Room. Turn right and enter the dining room after opening its door. Move to the right end of the long table and pick up a candlestick standing on it. Move to the kitchen door at the other end of the room. If you want, open the drapes covering the window at right and click on both levers to open the portal and see lots of fish. Open the door to the kitchen (see map) and enter through it. Kitchen. Pick up a large pressure cooker from the stove. Move to the right of the stove and open the right-hand drawer of the wooden hutch. Pick up a sheet of paper inside. Approach the sink at the far end of the room and place the pressure cooker in it. Click on the spigot above the cooker to fill it with water. Pick up the filled cooker and put it on the metal plate at right, in front of the locked cabinet. Put the wooden box into the oven below the pressure cooker, then add the paper notes to it as kindling. Save your game here as a timed sequence follows. If you've already opened the door leading from the kitchen into the corridor, close it now. Use the matches on the oven to provide a heat source for the pressure cooker. Use your finger to block the steam vent on top of the cooker (you don't need to be wearing the gloves to do this). The locked cabinet is then blown open; be sure to pick up an oyster knife from a shelf inside it. Poison gas is released and you don't have much time! Immediately return to the dining room, turn around and close the door leading to the kitchen to isolate the poison gas. Library. Return to the library and approach the fan grille at the far end. Use the oyster knife to loosen four screws at the corners of the grille. Block the rotating fan with the candle holder in your inventory. Move forward into the ventilation shaft. Lounge. After a visual flyby, you'll find yourself in the "lounge" at the front part of the ship, where the bridge is also located. Turn right and notice that there are two different doors exiting from the back part of the balcony on which you're standing. Turn left and face the large windows at the front of the ship, then follow the balcony at left and turn left until you are facing sets of vertical chains that control the protective shutters covering the windows. Look at the floor under the chains and pick up a bolt lying on the floor. Turn right and continue along the balcony toward the windows. Turn right again and approach a statue at the far side of the room. Along the way, you'll pass the bridge controls on your left and see another hologram of Nemo. From your position behind and to the left of the statue, continue forward on the main level (not along the left balcony). At the base of a support column, pick up another bolt. Click on the control box on this column to lower some spiral stairs. Turn right and go up these stairs to the upper level. Cartography Room. Move foward to a periscope that looks like a lecturn. To activate other areas in this room, click on the periscope controls. Turn left and move toward the far side of the room. Turn left and pick up a large rod located in front of the maps in the back of the room. Exit back down the spiral stairs to the lounge area. Lounge. Retrace your steps back to a point facing the bridge controls. Slightly to the left, click on a large floor hatch. Use the rod in your inventory to open the hatch. If you are finished exploring the lounge area for now, go through the hatch into the hold of the ship. Once you enter the hatch you won't be able to get back to the lounge without solving additional puzzles. Gears Room. Look down and descend the ladder twice to the floor of the room. Pick up a fan belt at the base of the ladder. Turn right until you are looking into the room through the ladder cage, then move forward. Turn left and pick up a large gear lying on the floor. Return to the ladder and go up one level. Move forward onto the platform, then turn around. Place the bolts on the ends of the two gear axles (the larger of the two bolts is used on the right). Return to the ladder and go up another level. Move onto the platform and add the fanbelt to the wheel at left. Continue forward on the platform, turn around and add the gear to the empty axle sticking out from the wall. Go back down the ladder to the floor of the room, then move toward the door at the top of the stairs in the diagonally opposite corner. Exit through this door into the ship's engine room. to turn off the steam. Move forward twice and observe another Nemo hologram. Click on the wooden toolbox at Nemo's feet and obtain some electrical fuses. Continue forward twice, then turn right and pick up a red crowbar ("claw") on the floor. Continue forward through the door into the next room. Dormitory. Turn around and turn on the light switch to the right of the door. Turn back around and click on a wall lever in front of the spiral staircase, opening a hatch in the ceiling at the top of the stairs. Move forward into the room twice, then turn left and click on the bulge in the mattress of the lower bunk. Pick up a bottle underneath the mattress. Turn right and continue to the end of the room. Turn right and open the locker at far left. Pick up some rubber boots from the locker and put them into your inventory. Open your inventory scrollbar and transfer the boots to your face icon so that you are wearing them. Move back to the spiral staircase and ascend it to the upper level. Electrified Corridor. You're standing in an electrified corridor that will electrocute you quickly if you're not wearing boots. At the top of the stairs, turn around and operate the lever on the wall at right to close up the staircase and allow access to the other end of the corridor. Move forward to the end of the corridor and go through the door. Museum. After another Nemo hologram plays, turn left and move toward a red sofa in the middle of the room. Turn right and extract a light bulb from the projector sitting on the wooden table. Exit the room and move through the corridor to the door at the opposite side. Pass through this door back into the lounge. Lounge. Follow the balcony to the bridge area of the ship. Turn around and approach a wooden cabinet on the main lounge level in front of the side balcony. Open the cabinet and place the bottle from your inventory onto the middle shelf inside. Wait a few moments for the left side of the cabinet to open, then take an icepick from the metal bucket at lower left. Return along the balcony to the door you came through from the electrified corridor and zoom in on the fusebox at lower left. Insert the fuses from your inventory in the following order, left to right: blue, white, green. When the fuses are correctly placed, electrical sparks are seen and a buzzing sound is heard. Re-enter the doorway at right back into the electrified corridor. Electrified Corridor. Move to the far end of the corridor, turn left and look down. Use the icepick to raise the wall panel and take a cable. Use the wall lever to raise the staircase, then descend and exit from the dormitory back into the engine room. Engine Room. Move forward once, then turn right and connect the cable in your inventory to the colored leads on the battery. Turn left and move through the rest of the engine room back into the gears room. Gears Room. Approach the large control lever on the floor in the center of the room. Operate this lever to get the gears turning. Go back up the ladder to the ship's bridge. Return up the spiral staircase to the cartography room. Cartography Room. Approach the projector on the far side of the room. Open its door and insert the projector bulb from your inventory. Turn on the projector using the switch at left. This discloses the ship's position and activates the Calculator in your PDA. To the left of the projector, click on an obscure piece of paper lying on the floor under a dark piece of furniture to disclose a solution for the shutter controls. Go back down the stairs to the lounge. Pieces can only be moved into the positions in which they belong, but after they've been positioned, you can click on them again to rotate them into the proper orientation. Some solutions may not "stick" and you may have to restart the puzzle. Best results seem to occur if pieces are placed in order from the largest to the smallest, with the ring-shaped pieces placed first. When the puzzle is correctly solved, it will burst with light and the steering wheel will no longer have a hotspot. Cartography Room. Return up to the cartography room and approach the periscope. Save your game here as a 5-minute timed sequence follows. Operate the periscope controls once or twice until a cutscene plays showing the other submarine dropping depth charges. Descend to the lounge. Lounge. Return to the bridge area and zoom in on the two controls to the left of the steering wheel. Check your PDA calculator to determine the coordinates of the recalculated route, typically azimuth 120 and list 0. Exit the PDA and enter 120 on the left dial (arrow pointing to the lower right) and 0 on the right dial (arrow pointing up). 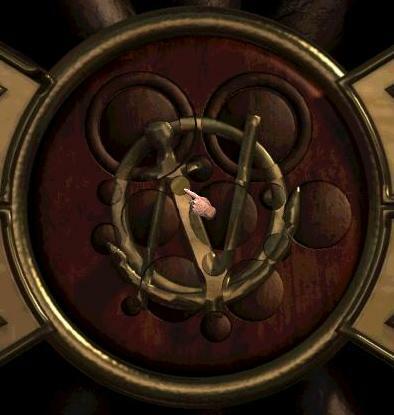 Press the button above and between the two dials and watch a cutscene. Press the button again to watch a second cutscene and remove the timer. The claw (crowbar) in your inventory can be used to re-enter the gears room from the bridge, if desired. For now, pass through the electrified corridor from the balcony and re-enter the museum. When this puzzle is completed, the back door of the museum opens. Go through this door into the next chamber. Return to the head of the bed, turn right and click on the wall portrait. 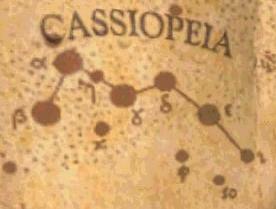 Insert the pendant into the slot of the safe, then zoom in on it and open it using the combination from the star map. Look down and pick up a key. Move to the center of the room and exit through the door closest to the wall safe. Grand Corridor. In the corridor, turn left, move forward twice, then turn hard right and enter another chamber. Officers' Mess. On entering the room, turn left and pick up a blue coat hanging on the rod. After putting the coat into your inventory, open its scrollbar and transfer the coat to your face icon so that you are wearing it. Continue toward the checkered dartboard at the far side of the room. Pick up a handful of darts from the holder beneath the dartboard. Also pick up another holographic lens from the receptacle next to the darts holder. Turn left and pick up a mechanical arm standing next to the overturned chair. Turn hard left and pick up a plate from the table. If desired, move one step away from the dartboard and shoot some of your darts at it. Exit the room back into the corridor. Grand Corridor. Turn left, move forward twice, then turn left and enter the room across from Nemo's bedroom. Guest Room. Turn left and pick up a statue. Turn around and pick up a coil of rope lying under the writing desk. Turn left and approach the sink sticking out from the wall. Pick up a mirror and a bottle of polish from the sink. Leave the room and cross the hall back into Nemo's bedroom. Nemo's Bedroom. Use the key to open the door to the right of the star map. Laboratory. If you're not wearing Nemo's coat with the metal plates, you'll be fried by the laser he has set up in this room. Move forward to the end of the room and turn off the laser. After another Nemo cutscene, turn around and attach the rope in your inventory to the periodic chart (the rope actually shows up below the chart, connecting the laser to a duct in the wall). Turn around and move forward once. Pick up a jar of acid on your right. Move once more toward the room exit, then turn left, open a drawer and pick up a cloth duster inside. Approach the closed door and use the acid on its glass porthole. Attach a holographic lens to the porthole. Exit through the door. Nemo's Bedroom. Reorient the mirror over the sink (it should show the door with a round handle). Approach the door leading to the corridor. Click on its glass porthole to remove it, then insert the remaining holographic lens from your inventory. Return through the door into the Grand Corridor. Grand Corridor. A picture on the wall to the left of the entrance to Nemo's bedroom shows an interesting reflection effect. Place the statue to the left of the guest room door, then add the plate, polish and duster to it. Move forward twice to the other other end of the corridor, angle right and place the mirror above the grate in the wall. Turn left and go down the stairs. These collapse behind you, so in the future you'll have to use the platform elevator controlled by the wall buttons at the top and bottom of the stairs. Continue to the far end of the lower passageway, then turn left and save your game since a 20-second timed sequence follows. Enter the doorway and wait for the robot to appear. Immediately turn around and go through the door to the hallway. Turn right and approach the stairs. Click on the red call button to the right of the stairs to escape the pursuing robot. Turn around and press the green call button to send the elevator back down to the robot. Note the rope end dangling from the ventilation duct immediately above the call button. If a hand cursor appears at the end of this rope, your laser trap for the robot may not be complete. Otherwise, press the red call button to bring up the robot, then immediately click on the rope end to destroy the robot. Go back down to the lower level and re-enter the room at left that housed the robot. Technical Room. Move forward toward the desk area and pick up pliers, a box of matches and wire. Turn left and approach the opposite corner of the room. Pick up a cold chisel from the middle shelf and an iron bar from the left end of the upper shelf. Turn around and add acid to the battery core on the floor. Add the iron bar and the wire, creating an electromagnet which should be added to your inventory. Go through the harmless flickering holographic image into the back room. Turn left and take a box of dynamite from the top shelf. Leave the back room, then turn left and approach a large wall cabinet. Open the cabinet and apply the cold chisel to the vertical strut in the center, melting the ice from the equipment at right. You need to use your pliers to cut certain wires and release door locks that have been engaged by the ship's computer. However, cutting a wrong wire depletes your life force due to electrical shock, and you can't make more than eight mistakes without dying. Cutting the correct wire opens the corresponding door, regardless of the state of the other wires in that color group. In each group, the correct wire to cut is connected to the terminal at lower left. At a minimum, you need to cut the far-left red wire and the center blue wire to open the doors to the two bedrooms. If you aren't carrying darts from the officers' mess, you'll need to open the door to that room as well. The correct yellow wire for the technical room has already been cut. Return to the hallway and go up the elevator by pressing the green wall button, waiting for the elevator to descend, then pressing the red wall button. Guest Room. Return to the guest room and approach the grille at the base of the wall to the left. Use the electromagnet to retrieve a key from behind the grille. Exit the room and return to the lower passageway. Face the door opposite to the one leading to the technical room. Place the box of dynamite in front of this door, then strike a match against the door surface to blow it open. Go through the damaged door into the next room. Pump Room. After receiving a clue about being a pub barman, throw a dart toward the machine in the distance. Turn right and attach the mechanical arm to the left-hand lever on the large pump machine. Apply the key to the arm (this will fail if you haven't thrown the required dart). Click once on the arm to turn it on. Click on the right-hand lever three times to reactivate oxygen flow in the ship. The timer increases to its maximum, then disappears. Return to Nemo's bedroom and exit through the door to the right of the sink. Damaged Museum. The ship is badly damaged in an attack by a giant squid. All inventory has been removed again. Approach the red sofa in the center of the museum room, then turn left and raise up the damaged display case. Pick up the ice axe disclosed underneath. Turn right and move to the organ area at the back of the museum. To the left of the organ, pick up a diving suit and a large metal organ piece. Return to the other end of the room and use the ice axe to free a harpoon lying inside a damaged display case. Pick up the harpoon, then turn around and exit through the door at the top of the short flight of stairs. Damaged Corridor. Move to the other end of the corridor, then turn around and use the wall lever to access the spiral staircase. What looks like reflective tinfoil in the stairwell is supposed to indicate flooded lower regions of the ship. Save your game at this point since a timed sequence follows. Put on the diving suit and a relatively fast timer starts running to indicate the suit's remaining air supply. You have multiple tasks ahead that all require working underwater with a limited air supply. You may be able to find certain areas that are not completely submerged, but unless you can replenish the air tank in your suit, you may be unable to progress in the game. If you go underwater without a diving suit, you'll have about 50 seconds before drowning. With the diving suit on, you'll have about 1½ minutes before running out of air, but this can be extended to about nine minutes if you can find an extra air tank. When you restart the game and restore from the same saved-game slot, you should have your suit's air supply restored to the maximum level. This method seems to work most of the time, but your results may vary and no guarantees are given. Submerged Dormitory. With your diving suit on, descend the stairs to the dormitory. Use the harpoon to scare away the squid's tentacle. Quickly move forward twice, then turn left and press the red button to dispose of the squid. Turn around and pick up the air tank, digicode and iron bar from the locker area. Having the air tank in your inventory both recharges some of your current air supply and significantly slows down the timer. Turn right and exit the dormitory into the engine room. Submerged Engine Room. Turn left and pick up two hooks and four rubber pieces lying on the walkway. Angle a bit more to the left and pick up a fifth rubber piece. Turn around and pick up a chain from the other side of the walkway. Turn left and proceed forward twice. Turn left and use one of the rubber pieces to repair the leak in the pipe. Several of the rubber pieces in your inventory may need to be tried before finding one that fits. Turn right and move forward two more times. Use a rubber piece to repair the leak at your feet. Face the door and repair two more leaks at the ceiling level, one to the left and one to the right. Move toward the door and use the organ piece to repair the pipe above the door. Go through the door into the next room. Submerged Gears Room. Cross the room to the ladder on the opposite side and go up two levels. There is some air at this height, so take off your diving suit to conserve its air supply. Move to the end of the platform and pick up a key lying on top of the overhead beam. Place the chain across the beam. Return to the ladder and put your diving suit back on. Descend to the floor of the room and move away from the ladder. Turn left and attach one of the hooks to the wheel lying on the floor. Go back up the ladder once to the middle platform. Go out to the end of the platform and attach the other hook to the end of the broken piece of metal, connecting it to the chain. Use the iron bar on the metal piece to dislodge it and raise the wheel. Look up and move the wheel off of its hook. The sound of a door opening is heard. Return to the ladder and go up twice into the lounge area. The timed sequence finishes at this point and you lose the diving suit from your inventory. You can return to the gears room, but without the suit you'll drown quickly in its submerged areas. Damaged Lounge. Move toward the red sofa to the right of the far statue. Angle right and move a second red sofa on top of the first, creating a large cushion. Ascend the support beam above the cushion to the cartography room. Damaged Cartography Room. Move to the far side of the room and pick up a white cable lying on the floor. Turn around and approach the periscope. Attach the cable to the mechanism extending to the right from the periscope, then add the key. This action dislodges the squid from the Nautilus, but somehow you can still see it in close-up through the windows at the front of the lounge. Return to the floor of the lounge. Damaged Lounge. Move toward the machine area to the right of the bridge controls, behind the right-hand statue. Look up and operate a handle on one of the pipes, draining water from the ship (and also preventing further access through the hatch to the gears room). Return to the back part of the balcony and approach the door next to the open ventilation duct through which you originally came from the library (not the other door leading to the electrified corridor). Pick up a rusted screwdriver lying on the floor in front of the door. Open your PDA and select Programmer. Click Yes to re-initialize the digicode you're carrying in your inventory. Return to the game screen and use the digicode unit on the panel to the left of the door. Go through the door. Corridor. Once again you're without any inventory as you begin a new stage in the game. There is no way back to the lounge since the door behind you seems permanently locked and the access panel is inoperative. Turn right and enter the library. Library. Move toward the back of the room, then turn right and check out a diagram lying on the floor showing a diving bell that could be used for escaping the Nautilus. Turn around and approach the desk area. Look down and pick up a diamond ring from inside the book lying on the floor. Exit the library and follow the corridor to the diving gear chamber. Diving Gear Chamber. On entering the room, turn left and pick up a coil of rope lying on the floor. Turn around and approach the right wall. Look up to obtain a hose (pipe) from the wall. Turn left and move toward the device venting steam, then turn around and pick up some pliers from the wooden box at your feet. Exit this room and cross the corridor into the dining room. Dining Room. Go around the table to the right to see another cutscene of Nemo. Continue left and pick up a pole underneath the damaged window. Turn left and use the ring to cut the glass on the cabinet. Pick up the alcohol bottle and piece of fabric from inside the cabinet. Return to the corridor. Corridor. From your position outside the dining room, turn left and face the library end of the corridor. Look down and roll away the carpeting in front of you, disclosing a large circular grate. Open the grate with your pliers, then use the rope on it. Descend through the grate to the room below. Technical Room. This room is now protected by an array of laser beams that will kill you if you touch them more than twice. Turn around and use the pole in your inventory to reach beyond the first set of lasers and touch each of the two reflectors to the right of the door, deactivating the lasers in the room. Turn right and approach the corner of the room where you found the chisel and iron bar earlier. Pick up a plumbing adapter from the floor, then turn around and move once toward the back room area. Behind the hanging lamp in front of the drawers, pick up a bundle of dynamite. Go back up the rope to the corridor and head for the kitchen. Kitchen. After entering the kitchen from the corridor, turn left and approach the sink area. Turn left again and pick up a metal box from the top shelf of the plate rack. Turn left and move back toward the door to the corridor. Look up to see steam escaping from a pipe running along the ceiling. Affix the plumbing adapter to this spot, then attach the pipe (hose). Move forward and turn right. Open the hatch behind the hose with the pliers. Move the hose end into the hatch to destroy the ship's computer. Exit the kitchen and return to the diving gear chamber. Diving Gear Chamber. Move toward the wall at right and pull down both levers in the control unit sitting on the floor, unlocking both parts of a hatch at the end of the corridor (the right-hand lever is inoperative until you've disabled the ship's computer). Return to the kitchen. Kitchen. Approach the front of the stove where its control knobs are. Put the box on the back left burner, then add the dynamite, fabric and alcohol bottle to it. Click on the left control knob to light the fuse and start a two-minute timer. Pick up the homemade bomb from the stove and exit the kitchen into the corridor. Turn right and go through the hatch. Diving Bell Room. Turn right, then left to follow the walkway around the spherical diving bell. Throw the homemade bomb toward the closed hatch at the end of the tunnel. Go back around and enter the bell. Facing the seat inside, turn around and click on an obscure knob to the right of the open hatch to close it. Angle a bit more to the right and operate two T-shaped handles between sets of gauges, then watch the endgame sequence.